Hiring a bike in London is easy with Santander Cycles. Simply hire a bike, ride it where you like, then return it to any docking station. London's public bike sharing scheme is available 24/7, 365 days a year. There are more than 10,000 bikes and over 700 bike docking stations across the city. More than 46 million bicycle hires have been registered on the bikes since the scheme's launch in 2010 (the scheme was originally sponsored by Barclays and branded as 'Barclays Cycle Hire' between July 2010 and March 2015). 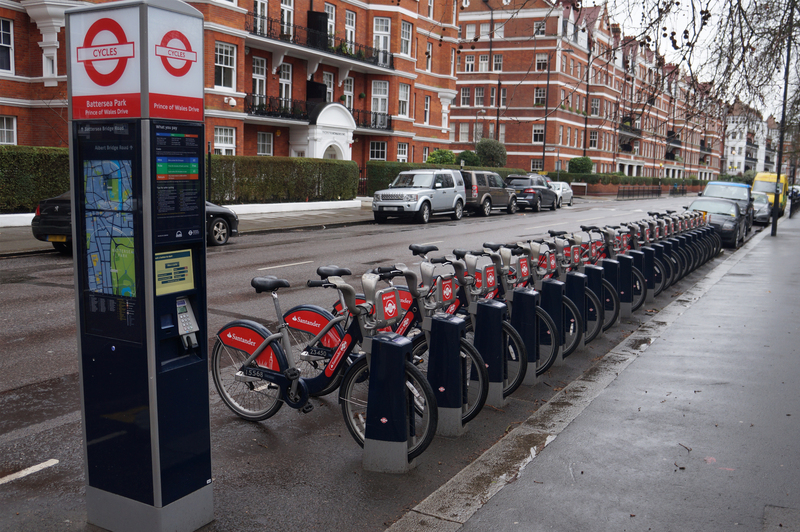 The "Boris Bikes" are available to casual users as well as members. Bikes can be hired by the day, week or year - based on a small registration fee (£2 to register for a 24 hour period). Once you've registered, the bikes are free to use for the first 30 minutes; payments then increase depending on how long you use the bike. Visit TfL's Santander Cycles web page to find out more, get maps and cycle routes and bike availability at your nearest docking station for hiring and returning the bikes. Click here to locate your nearest docking stations and to see the availability at each station. There is also a Santander Cycles app available on iOS and Android which shows the docking station locations and bike and docking station availability. If you want to hire a bike for a full day or longer, it may be cheaper to rent it from one of the bike businesses operating a cycle hire scheme. Click here to find your nearest. If you live in London and plan to use the hire bikes regularly you can sign up online at TfL's Santander Cycles web page for a membership key for a one-off fee of £3. The key gives you quick access to unlock a bike and you can keep track of your bike hire payments via an online account. If you don't return your bike, or you bring it back late or damaged, you may be charged up to £300. Check tfl.gov.uk/modes/cycling/santander-cycles for more information.